IAAPA, the global association for the attractions industry, has revamped its brand identity with a new look and logos. The finalised new logo includes a wide, bright colour palette representing the diversity of professionals and constituencies that make up th eglobal attractions industry. The burst in the middle conveys the sparks of inspiration when individuals come together, and the strong, solid IAAPA letters reflect the strength of the industry while the flares signify forward movement. "The new identity is the result of a thoughtful, three-year strategic initiative led by many IAAPA member" said Jeff Klocke, chairman of the IAAPA Branding Taskforce and vice president and general manager of Pacific Park on the Santa Monica Pier. "Through surveys, interviews, and research we can to better understand how members view IAAPA, and what services and resources they need and want from the association. IAAPA members shared they value the vast diversity found within our industry, and view IAAPA as the source to make lasting connections and feel inspired." 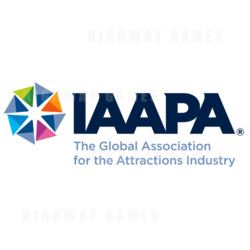 As well as the new brand image, IAAPA's three global expos have been renamed IAAPA Expo Asia, IAAPA Expo Europe, and IAAPA Attractions Expo. IAAPA has been running its trade shows for many years with overwhelming results, and the IAAPA Expo Asia will be returning to Shanghai, China this year. "While the IAAPA brand has a new look and feel, the association will continue to serve its members and uphold the highest levels of professional standards. IAAPA remains focused on helping produce safe and memorable experiences for all, and we look forward to this newest chapter in IAAPA history," said David Rosenberg, 2019 chairman of the IAAPA Board of Directors and Vice President of the Monterey Bay Aquarium.